What’s in a name? Officially it’s Saint-Barthélemy, but is most often called simply St. Barts or even St. Barths and is a French Overseas Collectivity (until recently part of Guadeloupe) and is part of the European Union. St Barts has long been considered a playground of the rich and famous and is known for its beautiful pristine beaches, gourmet dining in chic restaurants and high-end designer shopping. There is one small airport that can only accomodate small planes from St Martin and San Juan and the harbour is too small to accomodate cruise ships. The fact that it is hard to get to is part of the island’s appeal. Very unusual for a Caribbean island, the population of St. Barts is almost entirely of European ancestry. To find St. Barts villa rentals by owner, for your next holiday, simply select St. Barts as the destination in the “BROWSE BY” tool bar towards the top of the page. If you have set vacation dates use the “AVAILABILITY SEARCH” box, which blends in/out to the right of the slideshow. Alternatively, you can simply browse through the following list of St. Barths villa rentals by owner. Villa C'est La Vue is a luxurious 2 bedroom, 2 bathroom, villa with swimming pool perched high atop one of the most chic areas in Pointe Milou, St. Barth's. If you are looking for sweeping views of the Caribbean Sea and surrounding islands, as well as spectacular sunsets that will be etched in your memory forever, then C'est La Vue is the St. Barts villa rental for you! Find out more about Villa C’est La Vue, Pointe Milou, St. Barth’s. The beauty of Villa Triagoz will quite simply "blow you away" when you arrive! This private holiday villa is located in the Baie des Flamands on the island of Saint-Barthélemy (St. Barths) only 200 yards from the white sands of popular Flamands Beach. Villa Triagoz has 2.5 bedrooms (2 master bedrooms plus 1 baby room), 2 bathrooms, a heated swimming pool and stunning views of the surrounding hills and the Caribbean Sea. Guests of this St. Barts villa rental have free access to the facilities of the nearby, 5 star, Hotel Saint-Barth Isle-de-France and a rental car (Suzuki Jimny) is also included. Find out more about Villa Triagoz, Baie des Flamands, St. Barts. Green Lagoon (Lagon Vert) is a new, beautiful, spacious, modern villa with contemporary interior design and more than just a touch of European chic. This St. Barts luxury villa rental is located within the Levant Estate in Petit Cul de Sac, one of the most peaceful and exclusive locations on the island of Saint-Barthélemy. Green Lagoon villa has three spacious bedrooms, each with private en-suite bathroom, a comfortable lounge, media room, fully equipped kitchen, two separate swimming pools and generous terraces with stunning views of the turquoise lagoon of Petit Cul de Sac. Find out more about Green Lagoon, Petit Cul de Sac, St. Bart's. Villa Blue Lagoon (Lagon Bleu) enjoys a hillside location in the very private Levant Estate, Petit Cul de Sac on the island of Saint-Barthélemy with stunning views over the Caribbean Sea. This St. Barts villa rental is cooled by the sea breeze and only minutes away from the almost perfect crescent of soft, sandy beach with swaying palm trees. Villa Blue Lagoon has a total of 5 bedrooms, 5 bathrooms, two swimming pools and is equipped with everything you will need for your St. Barths vacation. Find out more about Villa Blue Lagoon, Petit Cul de Sac, St. Barths. Villa Yellow Lagoon is a beautiful, spacious villa which combines traditional architecture with contemporary interior design influences. This St. Barts luxury villa rental is located within the Levant Estate in Petit Cul de Sac, one of the most peaceful and exclusive locations on the island of Saint Barthélemy in the French West Indies. Villa Yellow Lagoon (Lagon Jaune) has four spacious bedrooms, each with private en-suite bathroom, a comfortable lounge, fully equipped kitchen, swimming pool and generous terraces with stunning views of the turquoise lagoon of Petit Cul de Sac, St. Barts. Find out more about Villa Yellow Lagoon, Petit Cul de Sac, St. Barts. Villa Small Lagoon (Petit Lagon) is a charming villa with a refreshing mix of classic and contemporary interior design and just a touch of European chic. This St. Barts villa rental is located within the Levant Estate in Petit Cul de Sac, one of the most peaceful and exclusive locations on the island of Saint-Barthélemy. Villa Small Lagoon has two spacious bedrooms, each with private en-suite bathroom, a comfortable living area, fully equipped kitchen, swimming pool and a terrace with stunning views of the turquoise lagoon of Petit Cul de Sac. Find out more about Villa Small Lagoon, Petit Cul de Sac, St. Barths. Villa Datcha is a stunning, modern villa with contemporary interior design and a playful touch. This St. Barts luxury villa rental is ideally located for exploring the island of Saint-Barthélemy. It is close to the capital Gustavia with high-end restaurants and equally high-end shopping, but also very close to the popular beach at Flamands and perhaps the most beautiful beach on the island at Colombier. Villa Datcha has three spacious bedrooms, each with private en-suite bathroom, a comfortable open-plan living area, fully equipped kitchen, swimming pool and terraces with stunning views of the Caribbean Sea. Find out more about Villa Datcha, Flamands Heights, St. Barths. 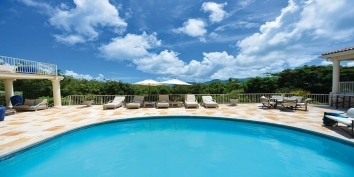 Villa Lama is quite unique and absolutely oozing with Caribbean charm. Built in a very traditional style with dark, hardwood furnishings, but very comfortably combined with all of the most modern conveniences. This St. Barts luxury villa rental is perched on the hills overlooking the Baie des Flamands on the very exclusive island of Saint-Barthélemy in the Caribbean Sea. Villa Lama has 3 beautiful bedrooms with private bathrooms, swimming pool, spacious indoor and outdoor living and dining areas and stunning ocean views. Find out more about Villa Lama, Flamands Heights, St. Barts. Villa de Moh is a gorgeous and luxurious villa located in the Heights of Lurin on the exclusive Caribbean island of St. Barts. This St. Barths luxury villa rental has three bedrooms with private bathrooms and a 50 feet long infintiy-edge swimming pool. Villa de Moh is a state-of-the-art villa and impresses with elegant interiors and beautiful design, combined with stunning views of the Caribbean Sea and Saint-Barthélemy. Find out more about Villa de Moh, Heights of Lurin, St. Barts. Is your St Barths villa rental already unique on CARIBIQUE? If not, find out how to list your Caribbean villa now!